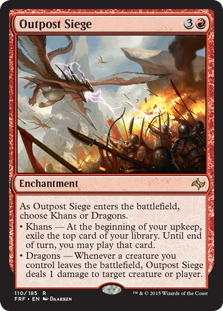 Find out why Patrick and Mike are going gaga over the — not one, not two, not three — but all four copies of Outpost Siege in Ben Stark’s R/W tempo deck! Mike has had a long, hard, road on the PPTQ grind. Playing in four events, Mike has finally put up a winning record! Mike played the “Top Level Podcast” version of B/U Control (changing only one card), before ultimately winning his PPTQ. The one change was removing the Treasure Cruise in the sideboard for a second Pearl Lake Ancient; in matchups where you might want a Treasure Cruise, Pearl Lake Ancient provides inevitability. Mike and Patrick also discuss prospective, additional, changes to the deck. What’s so great about Ben Stark’s R/W Tempo list? Is it that so many of the lands enter the battlefield untapped? Is it the streamlined “four-ofs” of so many great cards (that people have been afraid to play four copies of before now)? Why it’s now okay to play all four copies of Outpost Siege. Plus a discussion of Wild Slash, and why you might want Wild Slash more than Lightning Strike in this deck. A detailed examination of Abzan Control reveals the secret technologies of bringing in four copies of Fleecemane Lion from the sideboard. How R/W’s move from Lightning Strike to Wild Slash, plus the growing popularity of Valorous Stance helps the Fleecemane Lion case. Patrick discusses changes to Abzan! 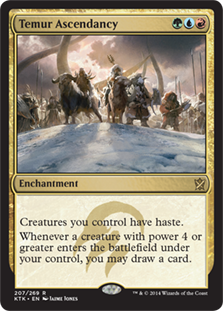 The position of Sultai Control in the current metagame! Antonino De Rosa’s innovative new Waste Not deck! How Does Temur Ascendancy Work? Wondering how Temur Ascendancy (or at least the Temur Ascendancy combo) works? Patrick explains the mechanics of this crazy new combo deck… And more! Why does Patrick favor consistency versus Mike favoring explosiveness? Does Abzan Aggro (versus Abzan Midrange) help expert players hold their natural edges? General nuances of Standard / which skills does Standard reward? Twenty-seven lands? Mike can get behind twenty-eight. Is Ashiok, Nightmare Weaver overrated? Is it ever right to play 61 cards? Chapin forgot Memphis was this weekend (this podcast indicates it is next weekend)… He’ll still be there! Patrick Chapin and Michael J Flores originally intended to talk about the various decks fielded by Patrick’s team — and the greatest team on Earth — the Pantheon at Pro Tour Fate Reforged. They end up recording some not-originally-intended-for-public-consumption chatter about Mike’s struggles in some recent PPTQs, disillusion with the Abzan clan, and general inability to win that results in a spontaneous brewer’s delight! In a kind of prequel to the main episode, you can listen as Patrick and Michael assemble a B/U Control deck for Standard designed to combat a format of largely Abzan decks, and how two of Magic’s most decorated deck designers approach metagaming, card selection, and sideboarding… While the microphones are “supposed” to be off. Patrick and Michael move on to Modern and talk about some of the successful decks of the Pantheon. Hall of Famer Jelger Wiegersma cracked Top 8 with a “stock” U/R Splinter Twin deck, and Jon Finkel finished out of the Top 8 on tiebreakers. Lots of in-depth discussion of these Modern archetypes — plus how to play with Amulet of Vigor — in the Modern middle section! 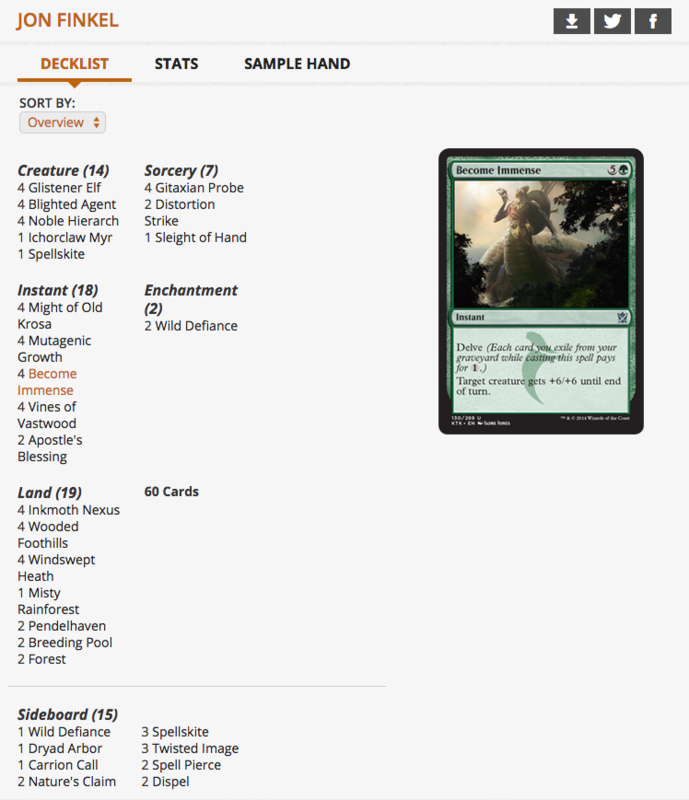 Finally, Patrick didn’t do well in the Modern portion of Pro Tour Fate Reforged himself… But he still loves his deck. Have you seen his Modern deck? Just try to listen to “Become Immense and Gurmag Angler” without falling in love with it! Patrick’s book Next Level Deckbuilding will be out in paperback by Friday this week. Do yourself a favor and check out Next Level Deckbuilding at Star City Games! Legacy lost Treasure Cruise but kept Dig Through Time. Dig Through Time is just starting to take the place of “the broken blue delve card” of the format. Thank God there are not Legacy Pro Tours any more! The absence of Legacy Pro Tours allows the format to largely avoid bannings and evolve on its own. The recent removal of Treasure Cruise from Legacy has yielded immediate diversity. 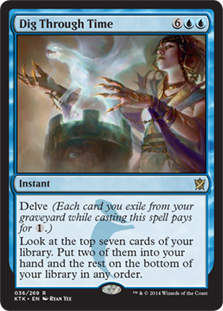 … Starting of course with a Delver of Secrets-free Grixis Control deck featuring Dig Through Time! Follow Top Level Podcast on social media!